Clean filters are vital to vehicle health--and your personal health, too--and replacement can help avoid expensive repairs. For the past several months most vehicle filters have become soiled in grimy winter roads. Since they are out of sight and out of mind, filters they may be one of the most underappreciated parts of your vehicle. “Filters might be the best example of something that costs so little mattering so much,” said Patricia Serratore, senior vice-president for the National Institute for Automotive Service Excellence. Fuel filter. Contaminants in gas—rust, dirt, tank chip—damage fuel injectors and the fuel pump. Your fuel economy may drop because contaminants also prevent fuel from burning efficiently. Inspect the fuel filter frequently, especially if you drive in dusty or smoggy areas. Oil filter. A new filter efficiently removes microscopic particles that cause engine wear and tear. Dirty filters can contribute to abrasion. Replace it every time you change your engine oil. Engine air filter. 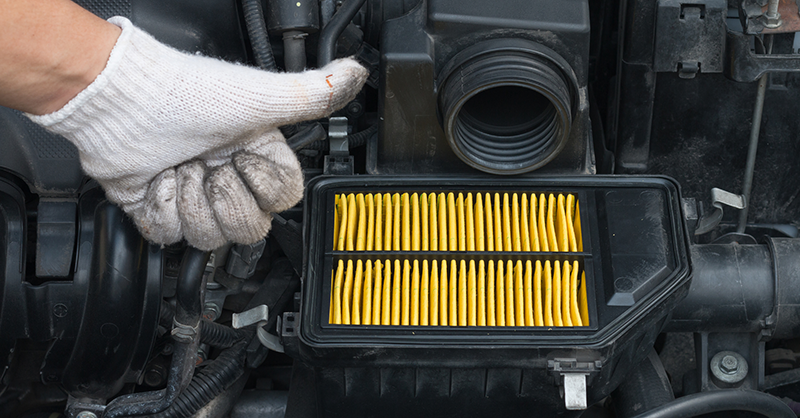 Like the fuel filter, a dirty air filter contaminates the engine compartment and lowers fuel economy. Inspect it in early springtime before pollen strikes. Cabin air filter. All the other filters are for the car itself, this one is for you and your passengers. This interior filter helps remove allergens and irritants from inside the car. Inspect your cabin air filter in early spring. “Simply put, dirty filters can cost you money. Don’t take them for granted. Replacing filters regularly can help a vehicle’s performance and lifespan,” Serratore said.